Finding God in Your Ruins: The Power of Remembrance - Those Who Dream, Inc. I still remember that day. The wind was cold — there wasn’t any sign of life around me — but I still managed to find a few fresh flowers from the local grocery store. I despise fake flowers in cemeteries. I grew up taking silk flowers to my Father’s grave with my mom. She would always make sure that my dad’s stone had plenty of flowers. But I hated them. To me, they were reminders of how no matter how hard we tried to bring beauty to our ashes, there was still no life in our ruins. But here I was in the same cemetery I had visited as a child —this time with a few white roses in my hands — but today I wasn’t visiting my dad. I looked down and at my feet lay two small headstones — each marked with my dreams. Under each name read, “Infant son of Josh & Jess Davis”. I laid a few roses at the feet of each stone — knowing they would just blow away in the wind when I left. But I didn’t care. I needed to see life in our ruins again. I had traveled nearly a thousand miles to get here — to my place of remembrance. For a long time after we buried both boys, I was numb. Life suddenly looked so different than it used to – than I dreamed it would. And we felt so alone. When we were traveling throughout the world preaching God’s presence, many rallied around us. When a blind man saw for the first time in front of us, so many people were encouraged. When our first born daughter was born at only 1 pound and defied every odd thrown her way, so many people made sure to send us messages and grace our social media pages with “God is good”. But when the miracles ended, those same accolades grew strangely silent. When people left us, it was easy to believe the lie that God had left us too. Then one day, I received a message from an old college friend of mine. She too had lost a son after he was born. And her message changed my life. “No mother should ever endure this once, much less twice. I just cannot imagine this, Jess. I do know this truth. He was good when He led Josh into your life. He was good when He empowered you to birth and raise Jolie and Tuck. He was good when He led you beside still waters as you grieved Beau. He has not changed. He is still good. Being present in our ruins can be a tricky place. Our eyes can tell us lies that seem right, but our hearts can show us the true way. Finding God in our ruins is possible. We don’t have to look far. It all lies in the power of remembrance. And there was power in that remembrance. It meant that even in the disaster that would soon happen, He was still King in the ruins. When the enemy comes in to steal the life from within you — and please know the enemy brings death, not God. He brings life — because He is Life itself! There is power in remembering who He is in our darkest days. That same power conquered the grave. And it can raise the dead in us too! That day when I read Kristin’s message, a part of me remembered. The love that caused me to leave my home and run to the ends of the earth to share. The love that was so powerful that even death couldn’t change it. That is who He is. The Love that became flesh and left glory for the dirt — Love Himself that joined me in my ruins and showed me an upside-down kingdom. Love that knows the same loss of a son — Heaven’s Son — and still used the death of one to bring Life to many. If you find yourself in ruins tonight, I want to remind you of the same message that changed my life after we buried our boys. He is STILL Good. He never changes. Don’t let what you see around you trick you into believing the lie that God isn’t with you. If you’ve suffered, if you’ve lost, and if you can’t see beyond the ashes around you, remember His love for YOU and His promise to never leave you. Forget the misrepresentations of God in others you’ve encountered. Forget the bad theology that many have attributed to Him. Forget the lies your ruins have tricked you into believing. Ask God to make Himself real to you. Ask Him to visit you. Even now. He is for you. He has gone before you. And He will never leave you. 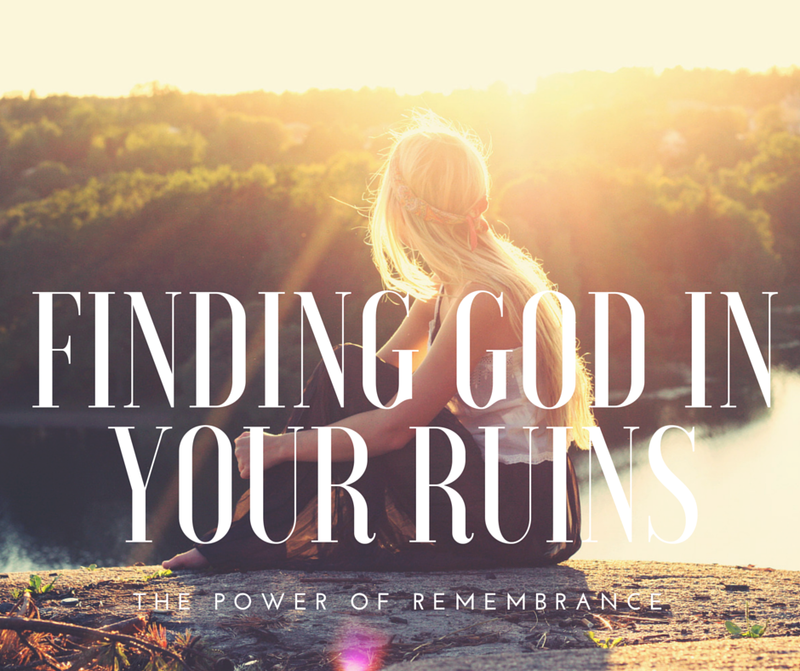 Are you struggling to find God in your ruins? How can I pray for you?